America loves to praise Dr. Martin Luther King Jr. but are we ignoring his message? (CNN) The upcoming Martin Luther King Jr. holiday takes on added significance this year, on what would have been a special birthday for the iconic civil rights leader. On Tuesday, January 15, 2019, Martin Luther King Jr. would have turned 90 years old. Of course, King did not even live to reach middle age, being cut down by an assassin’s bullet while standing on the balcony of the Lorraine Motel in Memphis, Tennessee, on Thursday, April 4, 1968. 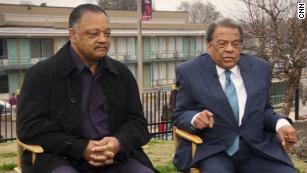 The Lorraine Motel is now a national civil rights museum, offering a hopeful sign of the immense political and social transformations that have taken place since that fateful day. Because of this 90th milestone, however, this year’s King holiday offers an annual opportunity for the nation to take stock of the struggle for black citizenship that turned a Baptist preacher from Atlanta, Georgia, into a recipient of the Nobel Peace Prize. It also allows us to assess the full measure of King’s message of racial equality, economic justice, and peace in our own time. Americans too often praise the man while ignoring the message. Martin Luther King Jr.’s resounding and living legacy informs a range of contemporary social movements fighting for civil and human rights for the most marginalized and oppressed populations in America and around the world. King defined a “beloved community” as a place not only free of injustice, but a society that actively promotes an ethic of love, justice, and humanity in its legal, political, and civic life, as well as its religious, spiritual, and moral spheres. King balanced a scathing indictment against war, racism, poverty, and materialism toward the end of his life with a defiant political optimism rooted in his faith that millions of Americans could mobilize a nonviolent army of the dispossessed, capable of fundamentally transforming the political and economic status quo. King’s search for racial justice and black citizenship found him consistently decrying the yawning gap between the lofty rhetoric of American democracy and its at times brutal reality. This gap continues to grow in our own time, visible in the comments made by Rep. Steve King and highlighted by President Trump’s efforts to build a wall at the nation’s borders at the expense of America’s national prestige and the rising cost of a government shutdown. Celebrations of the King holiday this year take place in the shadow of mass unemployment imposed by the President over an issue that many see as dehumanizing. The partial shutdown, which affects many historic civil rights museums and memorials including the National Museum for African-American History in Washington, means that hundreds of thousands of Americans who planned on taking pilgrimages to visit these sites will be denied the opportunity. The human cost on the nearly 800,000 federal employees who are no longer being paid is growing larger each day, with workers already living paycheck to paycheck struggling to provide for their families in the midst of what has been a crisis manufactured by the White House but most acutely felt by ordinary Americans. President Trump’s efforts to erect a wall, at the cost of the personal dignity of federal workers and America’s international reputation as a nation of immigrants, represents the exact kind of abuse of power that King spent his life fighting against. At his best, King painted a picture of American society poised at a historical crossroads that would decide both the destiny of democracy and the limits of human potential around the world. 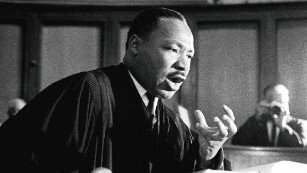 On March 31, 1968, King delivered the Passion Sunday sermon to the National Cathedral in Washington, DC, where he declared that “the goal of America is freedom.” Contemporary American politics, featuring debates over building walls, legislation designed to suppress voting rights, and widespread racial and economic inequality, betrays King’s legacy even as national historical markers and civil rights museums celebrate the man. King’s full-throated support for racial and economic justice can be seen in our own time in a wide spectrum of voices, from the Moral Monday efforts in North Carolina led by the Rev. William J. Barber, to the “Green New Deal” advocated by New York Democratic Rep. Alexandria Ocasio-Cortez. Efforts to demonize Ocasio-Cortez — a self-styled social democrat — coming from those who laud Martin Luther King Jr. reveal how out of touch America is with who King really was. Martin Luther King Jr. publicly supported the social-democratic governments that he visited during his European tour in 1964, when he traveled to Oslo to receive the Nobel Peace Prize. Within three years, King called for a guaranteed income for all people as part of his Poor People’s Movement to eradicate poverty, violence, and racism in America. Celebrations of King in our own times have often split him into two. The “good King” delivered a sermon for the ages at the March On Washington, promoted nonviolence as the key to achieving racial justice, and served as a friend and adviser to Presidents Kennedy and Johnson that made it possible to pass major civil rights and voting rights legislation. The “bad King,” criticized at the time by major newspapers, clergy, and politicians, boldly denounced the Vietnam War as immoral, linked the shortcomings of the Great Society to global war and domestic riots, and called for an American citizenship expansive enough to guarantee jobs, housing, food, and justice to the poor living in a vast sea of wealth. The radical King’s influence is best seen in the political actions of a new generation of activists, organizers, and young people, who honor his continuing legacy with deeds that push the nation closer toward the beloved community. 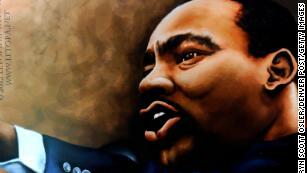 King defined that community as not only a world free of racism, war, and poverty. He argued that justice was what love looked like in public, and that all citizens could achieve greatness through a purpose-driven life of service. King offered an example to all Americans that a life dedicated to the mission of social justice and human rights represents our ultimate purpose and greatest vocation. He inspired American citizens, presidents, and the nation-state to take moral stands that entailed political consequences, something sorely missing from our national public and civic discourse. The issues of racism, poverty, voter suppression, housing inequality, unemployment, violence, and war that plagued King’s era remain. However, the key difference between then and now is the evolution of the civil rights struggle from one dominated by a singular voice to a contemporary landscape featuring multiple leaders who, in the best tradition of King, are stirring national debate over the meaning of freedom, democracy, justice, and citizenship.